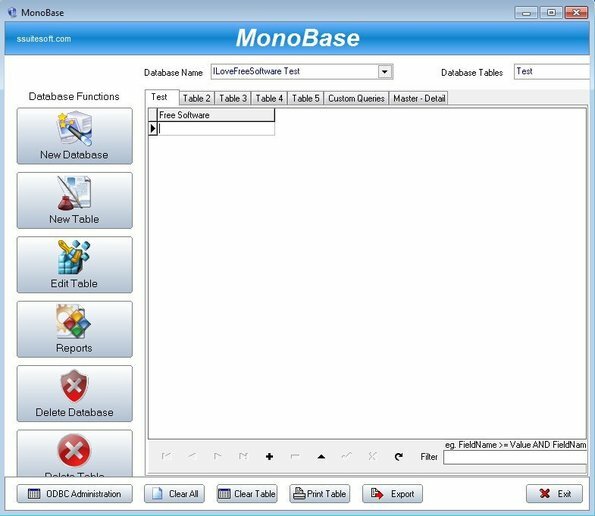 SSuite Office MonoBase is a free database management software for Windows where you can create and manage ODBC compatible databases. It’s very small and easy to use. Reports are also supported. Various types of reports can be created. They can either be tabular, single form or they can look like mailing labels. SQL query engine is supported with which you can run SQL statements. Up to 5 databases and tables can be open at the same time. 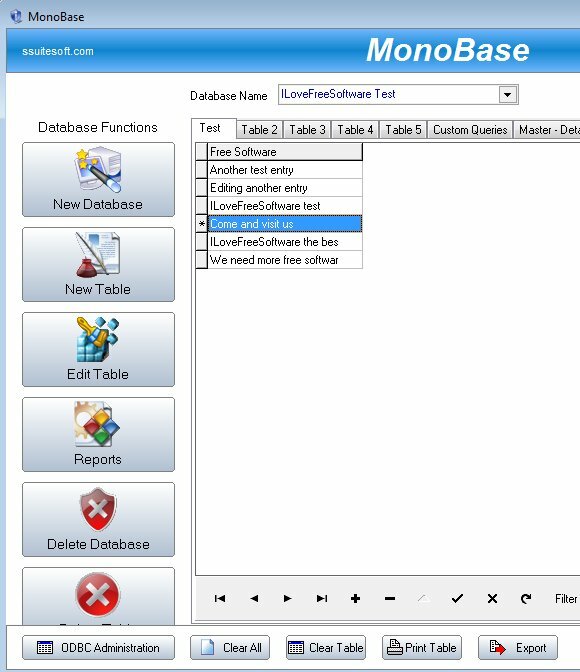 MonoBase is around 10MB in size, and even though it’s not very small it still comes with all the tools you’d expect from database management software. Everything that you need in order to manage databases can be seen in the left sidebar. Created databases and tables can be seen on the right. There’s tabs and drop down menus at the top which you can use to browse through them. All the empty white space on the right will contain database rows and columns, once that you add them. At the bottom you have additional controls and menus for managing the table rows and filtering the database. Similar software: LibreOffice Base, OpenOffice Database. Lot’s of other interesting features can be found in this free database management software. Like we said, even though it is small, it packs quite a punch. New Database button from the left sidebar creates a new database. While creating the database you’ll have to type in name, and then create tables of course. To open created database and tables you’ll have to use the two drop down menus at the top. Left one opens database, right one table. Selected database and table will open up as a tab down below. To add rows and entries to the database, you need to click on the plus button down below. With those same controls you can also browse through the rest of the database entries that you have added. To create a report you just have to click on the Reports button from the sidebar on the left. Wizards will guide you through the rest of the process. We’re not gonna be talking about the rest of the features found in SSuite Office MonoBase because there’s a lot of them, and for some you need to be familiar with the specifics of database management (like ODBC setup for example). 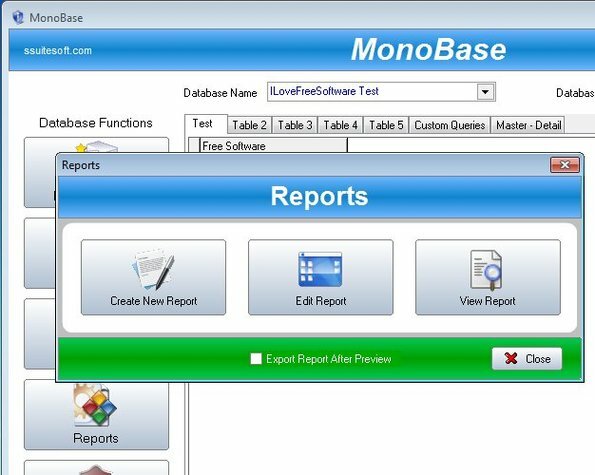 For those who are looking for simplicity and would just like an easy way to create and manage databases, then SSuite Office MonoBase is just the thing you need. Try it and see how it goes.